Dyson’s reputation for everyday innovation is formidable. Having famously revolutionised the vacuum cleaner, the revered British technology company has since turned its hand to a variety of appliances, transforming the way they function and delivering unprecedented performance levels. In small but significant ways Dyson technology has improved our day-to-day lives. The arrival of a Dyson hair dryer is good news for your hair. 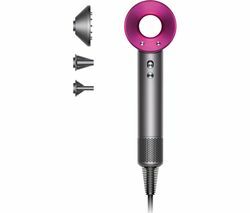 The Dyson Supersonic hair dryer further enhances the company’s reputation for radically re-thinking familiar technology. It’s lightweight, beautifully quiet, easy to use, extremely powerful and has the potential to change your beauty routine forever. One of the Dyson Supersonic’s simplest yet most ingenious innovations is its repositioned motor. 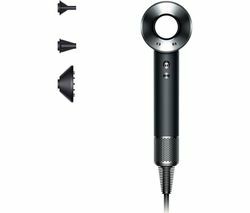 Unlike conventional hair dryers Dyson has positioned the Supersonic’s motor in its handle. This has a surprisingly significant impact, rebalancing its weight and shape and allowing you to spend more time comfortably drying your hair without getting an achy arm. The V9 motor also happens to be extremely powerful, spinning at up to 110,000 times per minute. Remarkably it does this at an inaudible frequency. And thanks to Heat Shield technology the Supersonic’s surfaces remain cool at all times so you don’t have to worry about it becoming uncomfortably hot, even when close-up styling. Dyson hair dryers boast an array of performance-enhancing features that help to ensure an immaculate styling experience every time. Air Multiplier technology accelerates hair drying speed, buying you valuable time when you’re getting ready to go out. What's more, the heat controlling microprocessor measures and regulates air temperature 20 times a second, keeping heat levels under control and preventing heat damage. With this cutting edge new beauty product Dyson has managed to deliver seriously powerful, professional-standard performance in a light, ergonomic and stunningly quiet hair dryer. Wondering how Dyson’s cutting edge hair dryers compare to the competition? 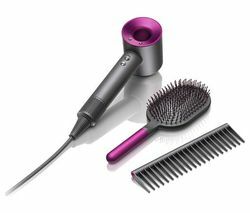 Explore our full range of hair dryers and hair styling products, including the latest Babyliss hair dryers, right here at Currys PC World.